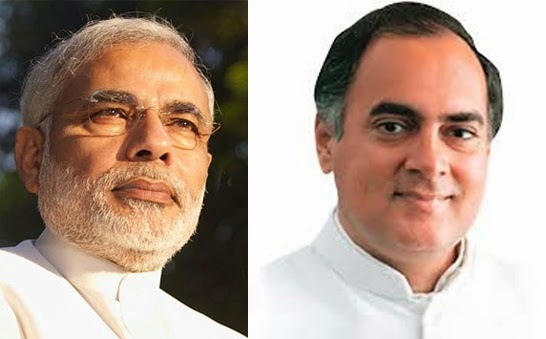 Today (5th May 2014), Congress has accused Narendra Modi for invoking Lord Ram Rajya during the Election Campaign at Faizabad (UP), in the viscosity of Ayodhya. Congress has also blamed Modi for using the picture of Ram as a backdrop. Even Mahatma Gandhi was dreaming of Ram Rajya, to denote better governance. It remains to be seen how the EC is going to deal with this accusation. Inyterestingly, Rajiv Gandhi started his 1989 Election Campaign from the same Faizabad (UP) invoking Ram Rajya. Wall Street Journal, one of the leading Amnerican newspaper wrote an article on this issue. I quote the relevant portion from the following link. He (Rajiv Gandhi) launched his campaign from the neighboring city of Faizabad in the autumn of 1989. The phrase connoted the ideal governance that Lord Ram had practiced when, Hindu scripture says, he ruled Ayodhya thousands of years before. It had been a term used by Mahatma Gandhi during India’s independence struggle. But it also was used by the Vishwa Hindu Parishad to promote the movement to construct a Ram temple. When Rajiv Gandhi used the phrase, his opponents accused him of pandering to divisive Hindu sentiment. Still, Mr. Gandhi further embraced the Ayodhya issue soon after. In early November 1989, just weeks before the general election, the prime minister sent Buta Singh, the home minister, to the town to participate in a “shilanyas,” or symbolic temple foundation-laying ceremony. Interestingly, in 1980s, both Congress and BJP were competing with each other in wooing Ram Bakthas to capture votes.